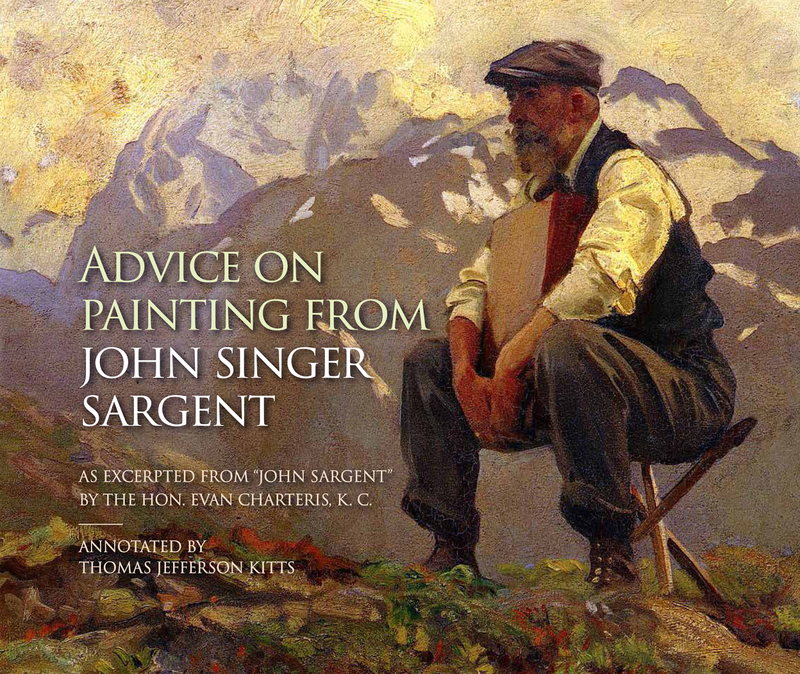 Thomas Jefferson Kitts | Blog: The Pacific Northwest Plein Air Show . . . The Pacific Northwest Plein Air Show . . .
Whoops, I forgot to post about this show before heading off to Central Oregon to deliver a painting–but I spent last week painting in the Pacific Northwest Plein Air 2010 Invitational. For the most part, the artwork in the show was centered around the town of Hood River, Oregon, although a number of paintings were from much farther afield. The entire show had a nice range in styles and content. Do see it before it closes if you can. It was a fun week of painting with old friends, and making new ones from Alaska, California, and Washington. And the Collector's Preview Party last Thursday was a lot of fun. At the Preview Party I picked up a 3rd Place for my painting: "Evening Light in a Pioneer Orchard" (a.k.a., the Bybee-Howell House, Sauvie Island). The week prior to the paint-out I'd brought a plein air class to the place and turned them loose to paint. Coming back a few days later, alone, was a gift to myself. What drew me to paint this orchard was the way the light flickered down through the branches in the heat of the afternoon, both obscuring and revealing the fruit as it hung from the trees or laid on the ground. It was a visual blur of light and color with nothing solid to hang the eye on. It was a compositional challenge for a plein air artist. A living, breathing, field-painting that had to be turned into some sort of order. If I were to provide a soundtrack for this painting it would consist of the buzzing and droning of late-season insects, raising and lowering in volume according to the temperature. The orchard itself is an historical place, an casual botanical museum consisting of over 115 apple grafts and other fruits, all collected from heritage farms around Oregon. In fact, the Bybee-Howell House orchard is a metaphor for Early Oregon. It represents much of what happened in this part of the world. Right now, those apples are crisp and tasty and free to anyone willing to come pick them. No Galas, Fujis, Grannysmiths, or Red Delicious here. These are the kind of apples your grandma's-grandma once baked with, and they cannot be found in your nearby grocery store. Even as I post this article those apples are still hanging on the tree waiting for you. If you hurry. I also have five other works in the show, which I'll upload in a later posting. 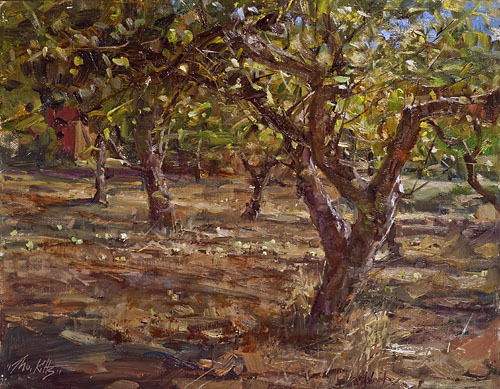 The show's judge, Ned Mueller, informed me that he vacillated between sticking the ribbon on another of my paintings, but finally settled on the pioneer orchard. I'm glad he chose that one because it is a personal favorite and I hope it goes to a long-term collector. Well okay, I'll be happy if it goes to a new collector too! Here is a slide show of the preview party, assembled by Celeste Bergin, this year's curator. Great job Celeste! It was a wonderful show to be involved with, and all of us artists appreciate how hard you worked to make it so. We are grateful for the time and energy you invested to put it all together. How you found time to also paint we can't imagine! I am presently planning my 2011 workshops and have at least four in mind. If any of the offerings are of interest to you then please let me know by email and I will put you on a notification list. Costs and dates have yet to be determined. 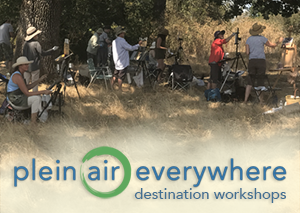 A five-day workshop, in and around Portland, Oregon, focusing upon what every plein air painter should know. And if any of you have suggestions for a class you'd like to take, let me know! Of course, Sergio. My only regret was I didn't get to spend any time painting with you. I liked your work very much, especially the painting with the rim rock foreground. When I make another trip out to the gallery before the end of the month, I plan to spend some time looking at that painting.